Operation Collaboration a Success: Congrats to Weather Quest Winners! 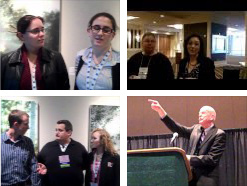 Congratulations to everyone who participated in Weather Quest at this year’s AMS Student Conference! Anyone who submitted the correct answer was eligible for one of the prizes and their entries were weighted and randomized. Random drawing winners were Jessica Taheri, Bevan Glynn, Sean Wolinsky, and Elizabeth Zbacnik, who won an assortment of prizes. Fifth prize went to Branden Spinner, Valparaiso University, and fourth went to Anna Schneider, Penn State University; both received AMS weather DVDs, a book, and a USB flash drive. Third prize went to Cassandra Kreckman, Penn State University–she received a Microsoft wireless keyboard/mouse and a book. Second prize winner Berkely Twiest of Penn State University won a Kindle Fire and a book. And the First Prize winner–receiving free registration to the 2013 AMS Annual Meeting in Austin, Texas, $50 Amazon gift card, and AMS weather DVDs….Dan Goff, of Virginia Tech! 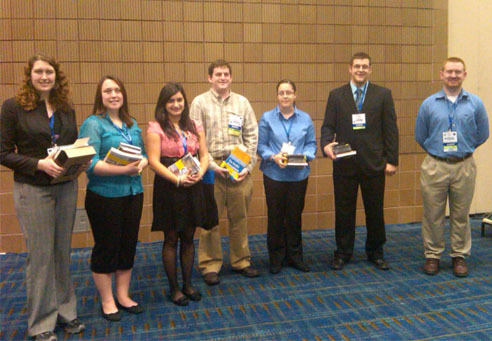 They've got Austin on their minds: Winners who were present at the conference collect their prizes.